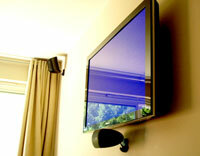 With the advent of flat screen t.v. 's and advanced wiring, systems encompassing half of the family room are obsolete. Relocating systems' gear and choosing t.v. 's preferable space area can open rooms and enhance enjoyment of your entertainment system. Slim-line speakers throughout the home add fluid warm sound at constant volume that observers enjoy at the perfect range. 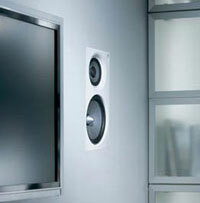 Aligning with light cans, in ceiling speakers' clean look and ultimate sound finishes every new home or remodel. 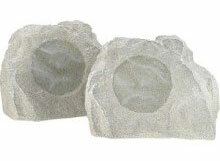 In the garden or with guests over, rock speakers can add sound to patios or "rock" the the back yard for parties. In discrete locations, rock speakers distribute music from the main entertainment center to areas in poolyards or gardens. 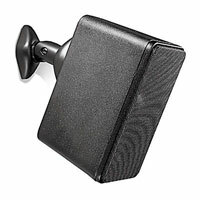 For large yards and pool areas, wall-mount speakers distribute music across patios and gazebo courts.